HomeNew CarsNewsJeep Compass - Petrol Or Diesel, Which One To Buy? The Jeep Compass has proven to be a hit, having sold over 19,000 units since its launch in India in July 2017. The Compass’ popularity can be largely attributed to the cult brand image that comes with the Jeep moniker while still offering plenty of value. The Compass has thus found a place in the buying list of every new car buyer who is looking for a luxury compact SUV in the range of Rs. 15 lakh to Rs. 20 lakh (ex-showroom). However, most potential customers of the Jeep Compass are confused about the engine option they should choose. In India, the Compass is available with two engines - a 2.0-litre diesel and a 1.4-litre petrol. While a diesel Compass is the de facto choice thanks to its higher torque and better mileage, the petrol variant’s lower price tag makes it equally enticing. What also works for the Compass petrol is the fact that the price spread between petrol and diesel fuel is down to Rs. 8-10 per litre at the time of writing this article. As a rule of thumb, users who drive more than 20,000km per year should opt for diesel models, while petrol versions are ideal for those with lower running kilometres. However, the SUV segment is largely driven by the cheaper fuel option, and thus choosing between the two can be quite tricky. 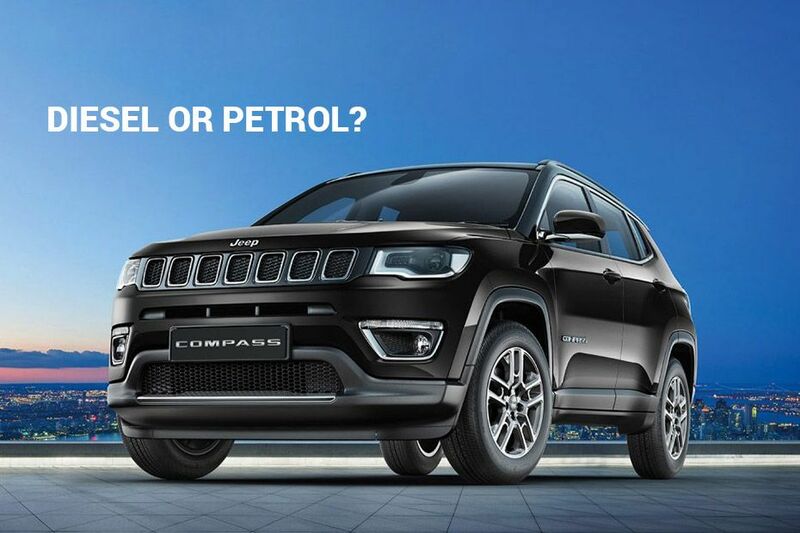 Hence, we have come up with a comprehensive comparison between the petrol and diesel models of the Jeep Compass to see which engine option is right for you. The Jeep Compass petrol packs a 1.4-litre, four-cylinder, turbocharged engine that churns out 163PS @ 5,500rpm and 250Nm of peak torque @ 2,500-4,000rpm. It is available with a 6-speed manual gearbox in the entry-level Sport trim and a 7-speed dual dry-clutch transmission (DDCT) in the higher Limited and Limited (O) trims. This engine comes with MultiAir technology, which Jeep claims results in a boost of 10 per cent in engine power and 15 per cent in available torque, as compared to regular engines of similar displacement. NVH levels in the Jeep Compass are fairly controlled. There is a mild cabin shake up when the engine is cranked. However, the noise and vibrations levels, even at idle, are more than adequately controlled for an SUV in this segment. The engine noise does increase when the rpm levels rise, though it doesn't get to irritating levels. Check Out: Jeep Compass Vs Hyundai Creta: Which Is Better Value? Despite being a smaller capacity engine, the 1.4-litre powerplant manages to pull the SUV from standstill without any major strain. Power delivery is linear across the rpm band, making the Compass petrol an easy-to-drive car in the city. While the 6-speed manual gearbox can be termed satisfactory with its short throws and smooth operation, the more expensive 7-speed DDCT (Dual Dry Clutch Transmission) automatic still leaves a lot to be desired. It struggles to find the right gear at the right time, especially in stop-go city traffic. Moreover, it has a tendency to hold on to a lower gear even when the revs rise. This not only makes the engine look a bit strained, but also negatively affects the SUV's fuel economy. The Compass petrol has an ARAI-claimed fuel economy of 14.3kmpl for the manual gearbox model and 14.1kmpl for the automatic variants. In our tests, the petrol automatic model managed to extract a fuel economy of 6.1kmpl in the city and 8.5kmpl on the highway. The petrol automatic Compass managed to clock a better 0-100kmph time of 9.67 seconds in our acceleration tests, which is 0.36 seconds faster than its diesel counterpart. The Compass diesel is powered by a 2.0-litre, four-cylinder MultiJet engine that churns out 173PS @ 3,750rpm and 350Nm @ 1,750-2,500rpm. This engine is a Fiat-sourced unit and is expected to be seen in various new SUVs, including the Tata H5X. Unlike the petrol, the diesel is available only with a 6-speed manual gearbox. The Jeep Compass diesel doesn't disappoint in the noise, vibration and harshness (NVH) department as well. Though there is the trademark rattle of an oil burner, the cabin is fairly isolated, especially once the SUV is on the move. The Compass diesel is a bit of a mixed bag when it comes to city driving. The steering has a nice firm weight to it and the gears slot in nicely even if the gear throws are a bit long. The clutch is a little on the heavy side though and also lacks feeling. At low speeds this means that even though the ratios are fairly low you need to be a little careful when crawling in first gear in stop and go traffic as it’s easy to stall the SUV. This just takes some getting used to, though, and after learning where the clutch bite point is and using a little clutch slippage, things became a lot smoother in the city. Jeep claims that the Compass diesel can deliver a fuel economy of 17.1kmpl. During our city driving test, it managed to return a figure of 11.07kmpl, while some sedate long runs yielded 16.02kmpl. There is no doubt that the Jeep Compass is a well-packaged, all-rounded product. Both the petrol and the diesel engines are potent enough to survive every driving challenge that you can throw at them. However, both these engines have their strengths and weaknesses, and it is thus important to classify who should buy what. There are two main factors that influence a customer's choice between petrol and diesel models: personal preferences and inclination towards fuel economy. Customer preferences are complicated to analyse & manipulate as some individuals inherently like the refinement and responsiveness of a petrol engine, while others prefer the diesel's practicality and grunt. However, fuel economy is something that we can help you decide your next purchase with. In order to do so, we have calculated the fuel cost for petrol and diesel models for two types of users: one who covers just 10,000km per year, while the other has an annual mileage of 20,000km. Please note that the fuel prices used here are from New Delhi, as on 1 May, 2018.